The charts below help show the importance of financial education, something that is not taught in American schools. Americans spend 17 years of their lives in school (many taking on tens of thousands of dollars in debt) in order to prepare themselves to find the best job possible. There is not one class during those 17 years that educates students on how to live a healthy financial life with the income you earn from your job. In addition, many of the jobs kids are going to school for today are not there waiting for them when they finish school (see lawyers). 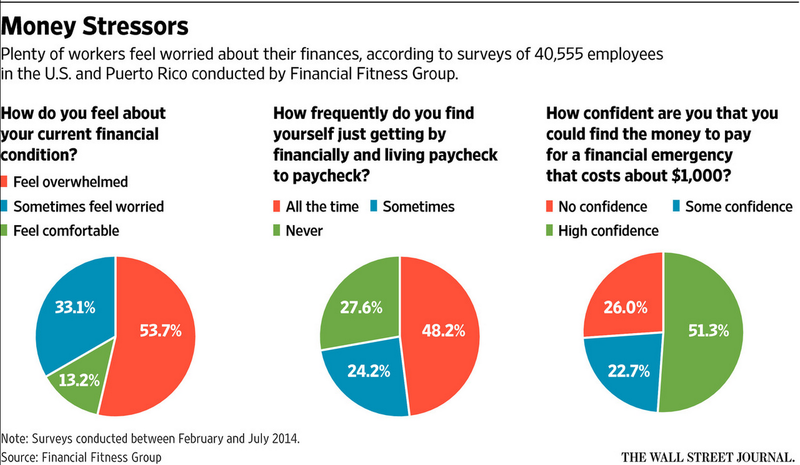 Here are two unfortunate charts that summarize the abysmal state of American financial balance. 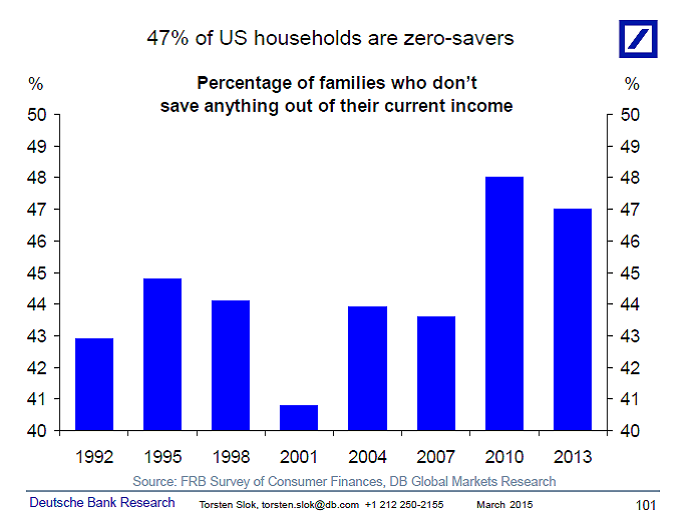 The first shows 47% of households have a 0% savings rate. The second shows the stress financial difficulties have on both work and life. If you spend the bulk of your day worried about paying your bills there is no question it will negatively impact both your daily work and family life. There is no discussion currently on the table for education reform in the United States so these trends will be with us for many years to come. 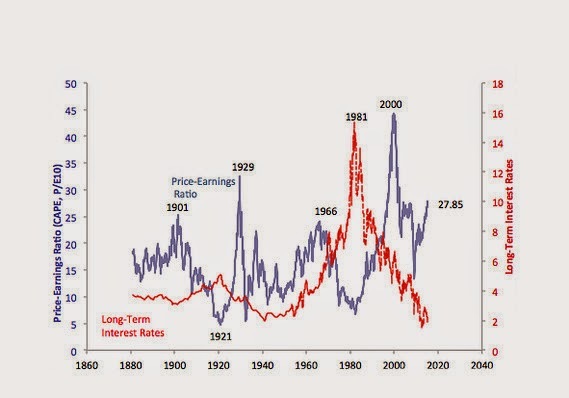 Robert Shiller discusses the grossly overpriced stock market in the United States based on his CAPE price to earnings ratio. He says there are relative values around the world in markets such as Singapore and Hong Kong. As I have said since the start of the year, if you live in the United States and want to invest in stocks do not let home bias keep you over weighted within the domestic market. You can look around the world to find Shiller's relative value. Here is the updated CAPE chart for U.S. stocks, hitting 27.85 as we enter the month of April. In an interview with Bloomberg earlier this week Shiller commented that 10 year returns at these levels are historically flat because "inevitably there is a major correction." "We've tried to squeeze too much juice out of the lemon. We have opted for financial engineering through bubbles. That provides some temporary gratification but ultimately comes back to bite you. We're in a bubble right now." "We will definitely have a difficult time dealing with another piece of bubble induced economic activity. The debt overhang is there." Legendary hedge fund investor and founder of Tiger Management, Julian Robertson, discusses his thoughts on the financial markets and economy with Fox Business. Robertson hopes the Fed raises rates this year so they do not let the twin bubbles (stocks and bonds) "boil over into a complete explosion." "I am looking at a bubble that is almost sure to pop at some time and I don't know when it's going to happen, but I know it's going to happen." "The bigger this bubble gets, the bigger the bust." "I don't think it's at all ridiculous to think of a sell-off like we saw in 2008." But who really wants to listen to someone that has been actively working in the financial industry for 58 years? I'd much rather listen to a 25 stock salesman who can command three trading screens and still fit the time in during the day to come on CNBC and tell the audience why U.S. stocks are cheap and safe. One of the bullish arguments for U.S. stocks I hear constantly is that dividend payments for many companies are higher than the return you can receive on a treasury bond out to 30 years. Dividend payments, we are told, are raised every year so your income will continue to rise with inflation in the years ahead. What is never mentioned during these discussions, which usually takes place when companies are trying to convince individuals to have their savings managed with an annual fee by their organization, is dividend payments can also be cut. Unlike bonds, when the economy turns down dividend payment cuts are one of the first tools companies use as they search for a way to save or locate desperately needed cash. 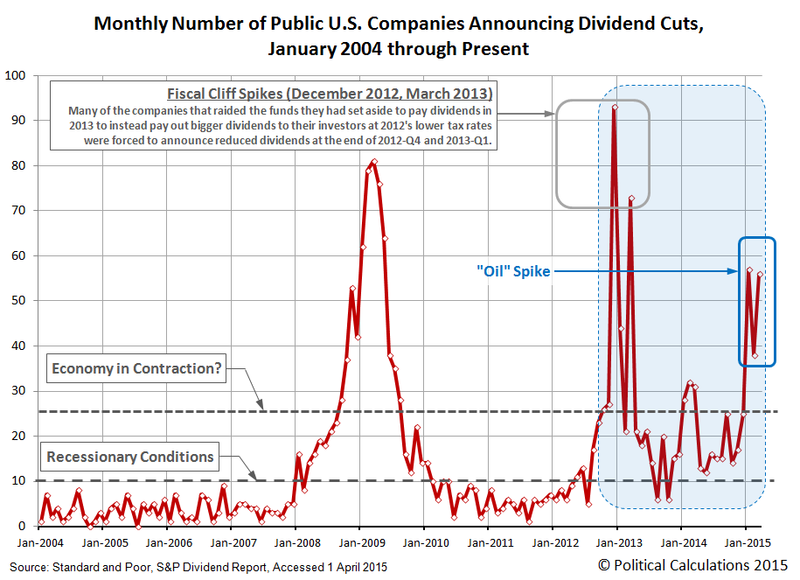 Last month the number of public companies cutting their dividend reached 56, a spike exceeded only by the financial crisis and fiscal cliff drama. This is due in large part to the collapse in oil prices because many companies are scrambling to find ways to save cash. This is not to say that bonds will perform better than stocks over a particular period. I only mention it so you can have both perspectives when making an investment decision after hearing a sales pitch that says "dividends will continue to rise and keep pace with inflation." Nothing hurts worse than a collapsing stock price at a time your dividend payments are being cut. I believe this is coming soon for many U.S. companies that have borrowed an excessive amount of money to re-purchase their own shares. A corporate executive's goal is to make their organization's balance sheet look as strong as possible the next quarter. Right now that can be accomplished by taking on debt to purchase shares due to today's anomalous low interest rates. If they do not make this decision to boost their share price in the short term, as other executives are doing just that at other companies around them, they will lose their jobs. An executive's job is to think of what's best for their organization and juice profits quarter by quarter. Your job as an investor is to see the forest from the trees and determine what is best for your portfolio over five years or more. When the tide goes out and these U.S. companies are holding a huge pool of their own shares as they collapse in price, with a large pool of borrowed money used to buy those shares, it will be clear who was actually swimming naked. We have been told relentlessly these companies own a record amount of cash today, but when cash becomes king investors will learn they also hold a record amount of debt on the other side of the balance sheet. Have You Purchased A Unicorn? 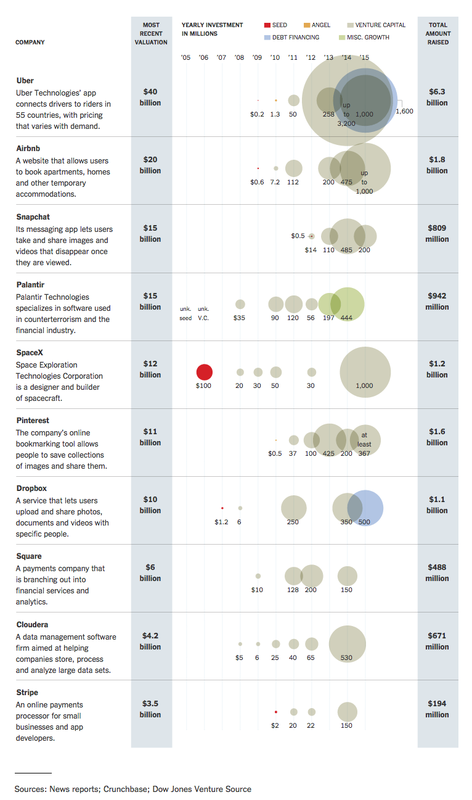 A nice snapshot of some of the investment darlings that have raised money over the past few years at a price which values their company in the multiple billions. Millions are definitely no longer cool as investors want to put their money into a company with a billion dollar plus valuation, now referred to as a "unicorn." Will these investors be able to cash out in time (take the company public and offload shares to the clueless public) before the mania comes to an end? Time will tell. In the meantime, we can watch the ridiculous make-believe valuation of these companies continue to rise and make the 2000 Internet bubble look like warm-up.